throughout Cheshire and Manchester.Since 2003,we have been working throughout Cheshire and with over 15 years of industry experience,we have all the skills and knowledge needed to ensure professional roofing services are provided to our customers. As one of the leading roofing companies in Greater Manchester, you can count on MG Roofing Service for all of your roofing requirements. Our team of roofers, are dedicated to providing the best possible roofing services available in the Cheshire area. We cover everything from repairs to installations and much more, no matter what your roofing needs might be, you can count on MG Home Improvements / Roofing Services. All of our roofers have undergone extensive training to ensure the highest level of service is provided to our customers. When it comes to needing roofers in Cheshire, be sure to get in touch with us and one of our team will be happy to assist. Why Choose Mg Home Improvements? We have years of experience in the roofing industry and our team of roofers have all the skills and knowledge needed to ensure professional roofing services are provided. Based in Winsford,Cheshire, we are perfectly positioned to cover the whole of the Manchester. 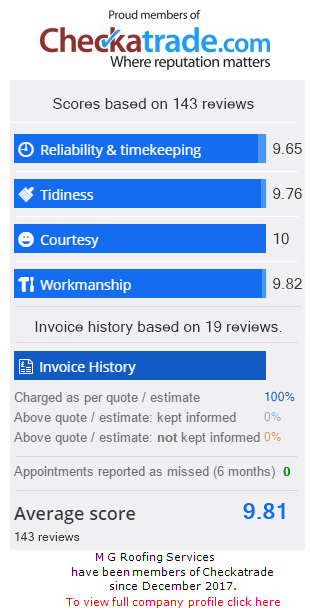 We strive for perfection on every roofing job we undertake, and we always go that extra mile to ensure the best level of service is provided to our customers. Having worked in the industry and throughout Manchester and Cheshire for many years, we have received some great feedback from our customers, which can be seen on our Testimonials page. We offer a comprehensive range of roofing services to our customers throughout Winsford,Greater Manchester and the surrounding areas in Cheshire.The roofing services we offer cover a range of roofing types such as tiled and flat roofs.Having worked throughout Manchester for many years,we have developed a well-known reputation for the roofing services we provide to our customers. Whether it be a repair or a roofing installation,MG Roofing Services /Home Improvements have you covered. We work closely with each and everyone of our customers, to ensure we not only meet but exceed their roofing expectations. When it comes to our roofing services, we only use quality and professional materials to ensure the highest standards of finish for our customers. With over 15 years of industry experience, we are capable of working on any type of roof whether it be lead, tiled or any other type of material.We offer durable and efficient roof repairs and if it can’t be repaired,then we’ll ensure you’re provided with a competitive quote for a new roof installation.For more information on the roofing services we provide,please don’t hesitate to get in touch with MG Home Improvements/Roofing Service.